Ken – pretty much the same as print royalties. When we sell one of my books to Audible or Graphic Audio, they pay an advance up front. Once sales earn out that advance, I start getting royalties for each sale. I’m told with credits, Audible pools the credit money for the month and divides it among sales made with said credits. 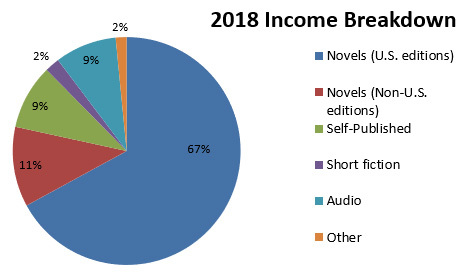 Mine last year was about 30K, thanks to a 4 book audio deal — the best year in years. I should probably add that my husband’s medical bills for the year were about 80K. So, you’re saying don’t sell my tools lol? I’m both shocked, and not. I figured it’d be at least 20k higher considering your body of work, but I’m not very surprised because of your genre and target market. 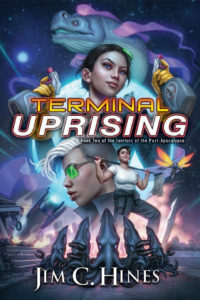 I feel Rowlings is a rare enigma, teen, and fantasy books don’t make people rich unless they go viral. I am curious how much of the 30 bux I give to Graphic Audio goes to you? Wow, is it already that time again? I feel like the last one wasn’t that long ago, but it’s been a whole year, my goodness. Time, what a strange thing. Next year I hope you’ll be able to tell us you’re Rowling in it. Thank you, Jim, for the insight. I keep my fingers crossed for all of you. Thank you so much for writing on this topic! I’m a data analyst by day and an amateur author by night and have found it challenging to find good data on the financial side of pursuing writing. Your survey results in 2016 were particularly helpful. Write on! You give how much money you earned, but how many book sales do those numbers represent? Do you think you could earn more moving into self-publishing? Michael Sullivan made a post on /r/Fantasy a few months back where he said he’s now thinking new authors might well do better self-publishing simply because audio rights have so much income potential if you don’t sign them away as part of a traditional publishing deal.